Clean Carfax and One Owner! The 2018 Chrysler Pacifica ranks near the top of our list of minivans, thanks to a well-built interior and a long list of features. It also delivers pretty good performance. The Chrysler Pacifica is a great minivan. Its cabin is filled with high-quality materials, and it remains quiet even when driving at high speeds. 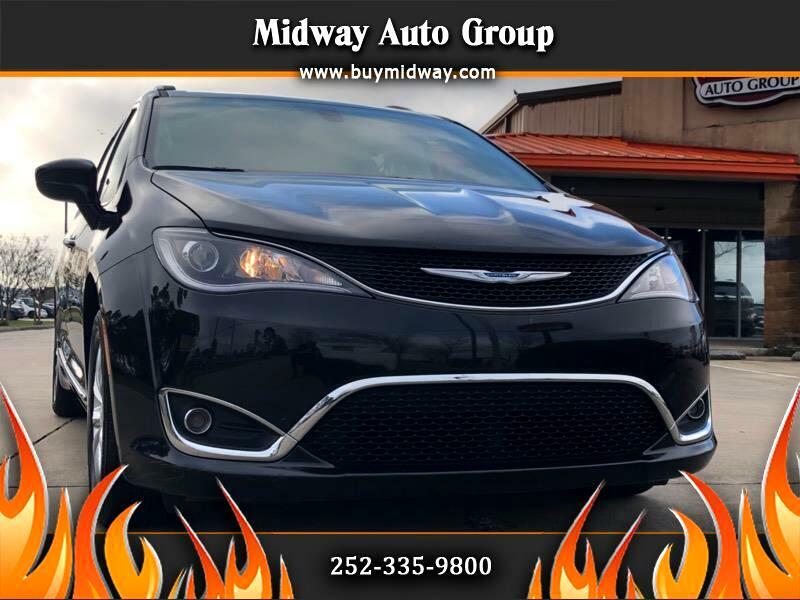 Only in its second model year, the Pacifica offers a lengthy list of modern technology that also includes plenty of driver assistance features. We named the Pacifica a finalist for our 2018 Best Minivan for the Money award because it has one of the best combinations of quality and value in the class. The Pacifica's innovative features, spacious interior, and good safety scores also led us to name it a finalist for our 2018 Best Minivan for Families award. You can boast about the Pacifica's performance just as much – it rides comfortably over rough roads, gets moving quickly, and has higher fuel economy than most other minivans. The Pacifica is also available as a plug-in hybrid. The Pacifica has less cargo space and smaller second- and third-row seats than what class rivals offer. Overall, there’s little else to complain about with this Chrysler. The Chrysler Pacifica has a base price of around $27,000 (for the Pacifica L). That’s not the lowest starting price in the class, but it’s close. The Pacifica has several higher trims that are much more expensive, though. Middle trims like the Pacifica Touring Plus, Touring L, and Touring L Plus start in the $30,000s, and the highest trim – the Pacifica Limited – has a starting price of nearly $44,000. The plug-in Pacifica Hybrid, reviewed separately, starts at $39,995. The Chrysler Pacifica seats seven or eight, depending on whether you get the available second-row middle seat. The front seats have plenty of room, but the rows get less spacious as you move back. The second and third rows are too firm for optimal comfort on long drives, and the third row is too cramped for adult passengers to sit comfortably. There are four full sets of LATCH car-seat connectors in the Pacifica. The system is more difficult to use than in some rivals, however. The tether anchors are hard to find and can be confused with other hardware. The lower anchors are set deep in the seat and require serious force to strap in car seats. There are high-quality materials throughout the Pacifica’s interior, and the cabin is quiet even at highway speeds. The interior looks good and has a functional design. The Pacifica has less cargo space than many minivans, but that’s not to say the cargo hold is small. With the rear seats up, you have more than 32 cubic feet of space, which is enough for about two dozen carry-on-sized bags. Fold the second and third rows down, and you have more than 140 cubic feet of space, which is enough room for furniture and materials for a home construction project. There are also plenty of features to make the cargo hold easier to use, such as Stow ‘n Go seats, power-folding third-row seats, and a hands-free power liftgate. The Stow ‘n Go seats are especially convenient because they let you fold down the seats into the floor to make the cargo area as usable as possible. In some rivals, you have to physically remove the seats to create an open cargo bay. The Pacifica also offers a built-in vacuum cleaner, though it's only available in the top trim. Standard features in the Pacifica include power second-row windows, a six-speaker stereo, and Chrysler's Uconnect infotainment system with a 7-inch touch screen, Bluetooth, a USB port, Uconnect Access, Apple CarPlay, and Android Auto. Optional equipment includes a tri-pane panoramic sunroof, tri-zone automatic climate control, KeySense parental controls, satellite radio, two 10-inch rear-seat touch screens, Alpine and Harman Kardon audio systems, a rear-seat DVD player, and an upgraded Uconnect system with an 8.4-inch touch screen and navigation. Minivans are known for having a lot of features, but the Pacifica has a long features list even by those lofty standards. This Chrysler offers something for everyone. At the center of it all is the Uconnect infotainment system, which has a responsive touch screen and is one of the best systems out there. The Pacifica’s fuel economy ratings are among the best in the class: 18 mpg in the city and 28 mpg on the highway. The other nonhybrid class leaders in fuel economy are the Honda Odyssey and Toyota Sienna, and you’ll spend about the same amount on gas each year whether you drive the Pacifica or one of those competitors. The Pacifica Hybrid, which is a plug-in hybrid, will save you about $950 per year in fuel costs.